For the past few weeks, I’ve been in Edinburgh, Scotland, visiting the Edinburgh Fringe Festival. It’s the largest arts festival in the world, begun in 1947 by performers who hadn’t been invited to participate in the (then) new Edinburgh International Festival. Since then, it’s inspired a multitude of Fringe Festivals around the world, including the Amsterdam Fringe Festival, slated for 5-15 September, itself an outgrowth of the Dutch Theater Festival. But even ‘fringe’ festivals grow up, and now, years on, there are ‘fringe of fringes’ springing up – in the case of Edinburgh and Amsterdam, known as “Free Fringe” festivals. For the September edition of the BizArts Buzz, Sam Heady, a member of the Sin Sin Collective, the group behind the Amsterdam’s Free Fringe Festival, was kind enough to answer some questions about Fringe and Free Fringe, Amsterdam style. Q: First, the Free Fringe practicalities: Who, when, where, how much? A: FREE FRINGE FESTIVAL AMSTERDAM runs 5 – 15 September 2013 at De Vondelbunker and, this year, in several other participating venues city wide. All Events are FREE ! Q: Who are you and your team, what’s your background? A: We are Sin Sin Collective, underground superstars. The team covers a broad base of disciplines. Core members are theatre makers/ animators/musicians who originally started out making live performances and visuals for club events, then moved into theatre and original pan-media revue style performances & plays. We also make films and comics. We have a very good Irish writer. That makes a lot of things possible and we often bring in artists with other skill sets on a project to project basis. Q: How much do the performers pay to be a part of the Free Fringe? Q: No money at all, just sweat. Everyone taking part, from the organizers to cleaners, bar staff, techs and performers, is a volunteer. A: How do they get to be a part of it? Is the selection juried? Q: Via our website anyone can find details of how to propose. We received several international proposals this year. Most of what was proposed this year is in the festival. It’s hard work to get a show on its feet so generally inferior and unmotivated projects fall by the wayside by themselves. What remains is strong, so far without our having to jury the selection. We have no specific criteria regarding content, medium or genre. We are interested in presenting as broad a range as possible and supporting the presentation of the work to the max. Q: Why yet another festival in Amsterdam? And why a Free Fringe? Why have you organized it, why would performers present their shows with your festival, rather than the Amsterdam Fringe? A: The Amsterdam Fringe are trying to brand Amsterdam’s avant garde, something that doesn’t belong to them. The truly innovative is, was and always will be on the street and that’s where we are. You can’t be the poacher and the game-keeper ! Confronted with the obstacle of having to pay big fees to perform even in modest venues, (artists mounting a show at Dublin Theatre Festival for instance have to fork over thousands for a broom cupboard ‘venue’) some pragmatic, rather than idealistic, artists are finding it cheaper to give their work away. This year Edinburgh’s Free Fringe Festival had grown to 713 free shows. Last year they presented work in 30 different Edinburgh venues. In Amsterdam most venues now have little or no subsidies to commission new work but there is a small but vibrant scene all year round nurtured by free spaces, some of them connected with the kraak (squat) movement, others not, such as private theatres and Astarotheatro. And small can be beautiful. When we first walked into Weerzin at Schijnheilig, a squatted art space on Passeerdersgracht, it was like coming home. We felt we had found our audience. The place was packed with a curious and appreciative audience every month for a mixed programme of music, poetry and performance – en alles mag. Performances, like pebbles become rounded in the sea of an audience so this feeds back into the quality of the work. Q: What’s your relationship with the Amsterdam Fringe Festival organizers? How have they reacted to the existence of the Free Fringe? A: They ignore The Free Fringe but I think they are aware that we exist because they stationed people to flyer the bridge above De Vondelbunker last year. We also invited them to come onto Radio Amsterdam FM for an open discussion about what is Fringe? last year but they declined. Q: I’m currently in Edinburgh, and seeing shows at the Fringe and Free Fringe here. There’s a bit of frustration among some presenters that their ticket sales are being affected by the ‘free’ options: the Free Fringe, the BBC stage. 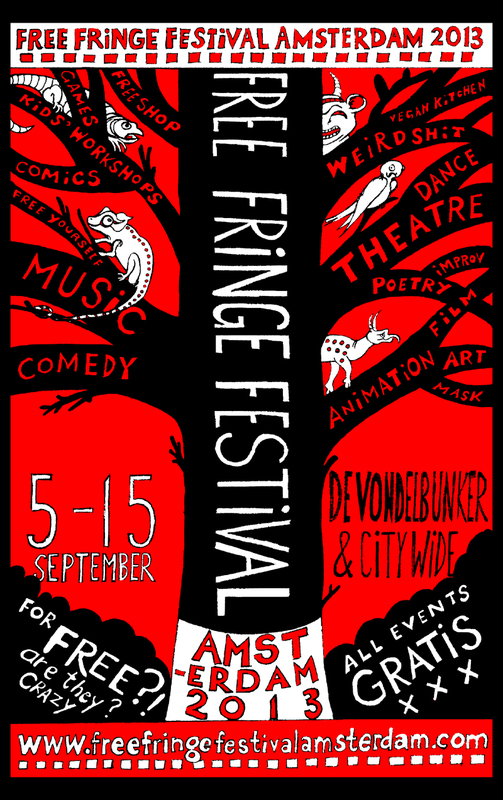 How do you see your Free Fringe affecting the Amsterdam Fringe, in the long term? A: The Amsterdam Fringe has become a very different animal to The Free Fringe. As far as I can see, its emphasis is on growing bigger, securing more corporate and state sponsorship and connections with The World Fringe Alliance. This is miles away from what we are doing. Our emphasis at the moment is on nurturing local cultural events and activities. We embrace the fact that we are a small festival. Being free keeps our festival small. This ‘disadvantage’ can be turned into an advantage which benefits the quality of the work we present. The Free Fringe can afford to give care and attention to its artists and the presentation of their work. Participants in The Free Fringe Festival Amsterdam are not left feeling like something put into a slot by a corporate hand. Also, none of our people from the bar staff to the organizers, cleaners, techs and performers, is looking over their shoulder wondering if someone is getting paid more than them. If participants don’t feel like doing something there is no financial imperative to do so. It can be very liberating and the directness of this way of working cuts out a lot of red tape. Unconstrained by commercial imperatives such as the target demographic of corporate or state sponsors, we are free to concentrate on doing our job: making work which is meaningful and fun for our audience. After all, if you take the fun out you extinguish the heart of theatre. If our formula manages to get better audiences – so be it. We don’t owe anything to commercial theatre. The whole arts sector is currently undergoing seismic transformation. Take the music industry, for example. A lot of people say boo hoo the record companies are dead but in the ‘old days’ it wasn’t so great. While these super rich corporations were swollen with the revenue from record sales, relatively little was trickling down to the artists. The situation is very difficult for artists at the moment but it is in flux. Quite how artists will be able to earn a living I don’t know but I think we must keep working and keep control of our own creative choices. Q: I’ve experienced the quintessential Free Fringe experience here: sitting in a basement with two other audience members. Part of that is a publicity problem: the Free Fringe doesn’t get the media/publicity that the regular Fringe gets. How are you addressing that problem? A: Maybe Edinburgh is just too big. Publicity is a dark art and the truth is you never really know but if you ask the likes of De Nieuwe Anita for instance, a lot of it is about just keeping going so that word of mouth builds up. Sin Sin Collective did The Hellfire Club there at Halloween and there was only a small audience and we did another one on St Patrick’s Day and packed it out. As you say, word of mouth is the most important thing and it helps if the venue has a regular following. We were lucky and had full houses for all the shows at The Free Fringe last year. We are hoping to repeat that. We try a little bit of everything – radio, facebook, YouTube vids, website, emails, phoning, a few posters & flyers in key places that won’t just dump them in the bin. It is progress that with the advent of new social media the distribution tools are in the hands of the artists if they can develop the skills to use them. Q: Let’s be blunt: some of the reason there were only three of us in that basement was a quality issue. If the show isn’t very good, the most important publicity doesn’t kick in: word of mouth. What would you say about the quality of your shows, as compared to the Amsterdam Fringe, or any other festival, for that matter? A: Lots of people think that if you pay for something it is worth more but think again. It is just not the case that the more you pay for a ticket to a show the better the quality of the experience. The power of a work of art also has much more to do with the contemporary relevance of the work and the skill and flair of the artists who made it. You can get stinkeroos or flashes of brilliance at any level (mind you, the Stadsschouwburg seems to be able to maintain a constant flow of the former – whew !). That said, our strict quality control ensures there are no stinkeroos in The Free Fringe Festival Amsterdam. We are lucky to have some highly skilled, experienced and dedicated professional artists taking part. People who welcome the opportunity to showcase their ongoing work and be part of our little festival for the love of it! We are also able to punch above our weight artistically through what one of our team calls ‘the luxury of poverty’. For example, we present original shows involving lots of people and a long time to prepare, which even richest of commercial theatres could not afford. This year, for example, The Free Fringe Festival will present Samuel Beckett’s Endgame which has been in rehearsal since January. Next year we plan to do a new version of Alfred Jarry’s Ubu Rex which will have a big cast, a big build and live music. It can be surprising how the impossible becomes possible when you work this way founded on good will and ingenuity. Often the necessity of finding an ingenious solution can lead to innovation. We are very interested in bending, blending and combining different disciplines, traditions and genres in new ways within our work. Q: Are there any shows you’re particularly excited about this year? Can you give us some buzz about a favorite? Endgame Samuel Beckett’s darkly comic masterpiece, portraying his apocalyptic vision, will be presented in the haunting location of De Vondelbunker, a nuclear fallout shelter built in 1947 under the bridge in Amsterdam’s Vondelpark. Friday 13 & Saturday 14 September at 20:30, Sunday 15 September matinee at 15:00 The cast is Carlos Trafic, Roberto Bacchilega. The Free Fringe Festival Amsterdam is in its second year showcasing Amsterdam’s Real Fringe scene – the best of Amsterdam’s independent, cutting edge and subsidy free arts and performance and all for free – are they crazy ? Through organizing the Free Fringe Festival we have come in contact with several other organizations that do things for free. Joe’s Garage in Amsterdam Oost and ZsaZsaZine, based at Het Foort van Sjakoo International Bookstore operate free cultural events all year. Our friends at Joe’s Garage also run one of several Free Shops which have sprung up around the city where you are free to donate your good quality unwanted stuff and rummage for things you need. Q: What would be your general advice to Free Fringe goers? How should they prepare themselves, in order to have the best possible festival experience? A: The Free Fringe audiences are all mixed up ! A theatre-goer who comes to see a classical play might end up staying for a band or revue. Last year visitors to De Vondelbunker for Monumentendag carefully inspected and even photographed our props and costumes set up for the evening’s performance as if they were part of the history of De Vondelbunker – which, I guess they now are! Kids who come this year to do a theatre workshop in De Vondeltent may well catch a dance performance in the open air, an exhibition of video game inspired art or see new animation from Japan. The program is very varied and there are continuous activities, especially at the two weekends of the Festival (7/8 September and 13/14/15 September) at the festival’s ‘ground zero’, De Vondelbunker plus Astarotheatro, who have their own Free Fringe Festival Amsterdam program of documentary film, theatre and revue shows. The Free Fringe Festival Amsterdam has a genuinely diverse mixed bag of events to suit all tastes. If you are not adventurous, curious or prepared to be amazed, stay away!